Colorado Peak Politics | GUN CONTROL SIT-IN: IS Bennet Protesting His Way to the Veep Slot? 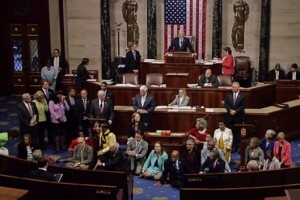 GUN CONTROL SIT-IN: IS Bennet Protesting His Way to the Veep Slot? Not content with the dog and pony shows conducted by Senate Republicans, U.S. Sen. Michael Bennet says he abandoned those chambers yesterday and fled to the House where Democrats shut down the floor by staging a sit-in to demand media attention gun control. We can’t verify he was actually there, because the C-SPAN cameras automatically turn off when the House is not in session, and that occurred shortly after the Democrats began reliving their glory days of the 1960s. We also scoured photos and videos on social media to determine whether for some odd reason, a U.S. Senator was actually intruding on House floor activities. We didn’t think senators were allowed in the House except when invited for events like the State of the Union or joint sessions of Congress. And for that matter, we’ve never seen a lowly House members running around the floor of the upper chamber. Now there’s a precedent we didn’t research, whether it’s standard procedure for senators jockeying for the Veep slot to push their way into House business if it endears them to the party’s presumptive presidential nominee. In that case, perhaps Bennet was actually there.